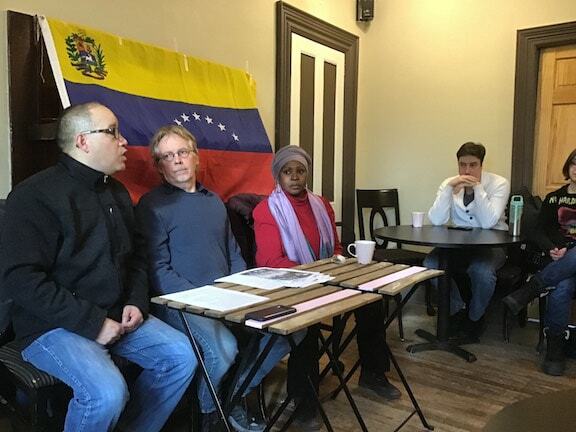 KJIPUKTUK (Halifax) – Last Saturday afternoon a public meeting was held at the Glitter Bean Cafe in downtown Halifax to denounce the ongoing attempted coup d’état in Venezuela. The meeting was well attended, so much so that it was standing room only. There were representatives of a number of groups: No Harbour For War, the Voice of Women for Peace, the Halifax Peace Council, and the Canadian Network on Cuba. Panellists included Isaac Saney, a member of the Canadian Network on Cuba, Tim Bood, a local physician who has volunteered as an election monitor five times in Latin America, and Afua Cooper, James R. Johnston chair in Black Canadian Studies at Dalhousie University and the current Halifax poet laureate. One often repeated myth is that Maduro won his second term through a rigged election. Bood, who is an experienced election observer, said that this claim, repeated by Trudeau, is one hundred percent false. He went on to describe his observations in the 2015 Venezuelan elections in support of his view. Afua Cooper described how the CIA overthrew the government of Ernest Manley in her native Jamaica and did the same throughout the Caribbean and Latin America. Dr. Saney, for his part, moderated the discussion, and described a long history of US hostilities against Cuba, Venezuela and elsewhere. The United States of America has been in the regime change business for many years. There are many examples of how the US takes it upon itself to put supportive governments in place, as it did in Guatemala when the government of Arbenz was making trouble for the US-owned United Fruit Company. There are many more examples in South America alone. With US help Chile’s president Salvador Allende was deposed and murdered, and the CIA famously made countless efforts to kill Fidel Castro. The US was also involved in an earlier effort to impose regime change on Venezuela when it tried to depose Hugo Chavez in 2002. That effort failed. Guaido, the self-appointed challenger to Maduro, is from a small, extremist right-wing party, and hand-picked by the US government to lead its current regime change project. Meanwhile, the US has imposed sanctions and other measures designed to weaken the Venezuelan economy. In typical imperialist fashion, they do what they can to destroy a country’s economy, promote violence and chaos in the streets, and blame it all on the regime they are trying to overthrow. The mainstream media is full of propaganda stories about how the lawfully elected president of the country, Nicolas Maduro, is actually a dictator. They are falsely portraying Venezuela before Hugo Chavez as being a capitalist paradise. Behind these claims lies the fact that Venezuela is a country rich in resources including the world’s largest proven reserves of petroleum, huge gold deposits and other minerals. Aside from the mineral wealth, there is the political inconvenience of the Bolivarian regime of Chavez and Maduro. Chavez used the oil wealth of the country to finance social programs which greatly improved educational levels and quality of life for Venezuelans. Venezuela also asserted its autonomy from the United States which inspired other peoples in Latin America to do likewise. This was the beginning of the so-called “pink tide.” Ecuador, Brazil, Argentina, Bolivia and others followed Venezuela’s example. People who attended the meeting offered up many suggestions for further actions in support of Venezuela. Stay tuned!